ORGANIC CAISSE Essiac TEA can build the immune system. 60 Capsules • BOOST IMMUNE SYSTEM. Removes heavy metals, detoxify the body, restore energy levels, and rebuilds the immune system. An effective blood, liver and lymph cleanser. BOOST IMMUNE SYSTEM. Removes heavy metals, detoxify the body, restore energy levels, and rebuilds the immune system. An effective blood, liver and lymph cleanser. PH LEVELS. Changes your PH level from acid to alkaline. 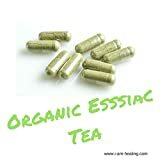 ORGANIC Essiac TEA CAPSULES contain the same unique powerful blend of 8 herbs as our powerful ORGANIC Essiac TEA. Contains the Essential SHEEP SORREL ROOT. Beware of other products available that do not contain the root. The root of the Sheep Sorrel is a vital element of the tea. Without it, the tea is ineffective. These eight 100% naturally occurring herbs, when combined in capsule form can be of huge benefit to those suffering from a weakened immune system and various illnesses. Not to be taken during pregnancy, by nursing mothers or infants. This tea is a blend of natural ingredients including: Papaya Ginger Thistle Chamomile Persimmon leaves Marshmallow leaves Myrrh (an Arabic resin that has been used for medicinal purposes for centuries) Malva leaves It’s the combined properties of these all-natural ingredients that help in cleaning the body of its toxins, especially in the digestive system. Just 2 cups of tea daily allows gentle cleansing of the body, and when combined with a healthy diet, helps with weight loss. This listing is for a one-week supply of IASO tea. YOU WILL RECEIVE ONE SEALED SACHET containing two tea bags which you make up to 1 gallon (approx. 4 litres) with water then drink it over the following 7 days – you could use 1 bag to make half as much if you prefer. Drink one glass with lunch and one with dinner, optionally you can add an extra half glass with a snack during the day. I LOVE THIS TEA SERVED CHILLED WITH ICE AND A SLICE OF LEMON – AND A SPRIG OF FRESH MINT WHEN I HAVE IT. SERVE IN A GLASS WITH ICE – IT LOOKS SPECIAL AND TASTES DELICIOUS!IMPORTANT!! If you are trying to lose weight you should still follow a healthy diet while using IASO tea – this isn’t a magic potion! Weight loss varies from person to person but has been logged at 5lbs in the first 5 days of drinking IASO tea. WHEN YOU ARE ON ANY WEIGHT LOSS OR HEALTHY EATING REGIME ALWAYS REMEMBER TO DRINK LOTS OF WATER! This product contains cathartic herbs. Pregnant and nursing mothers, the elderly, children and individuals suffering from any illness or health condition should consult with their Doctor before using this or any herbal supplement. PLEASE REMEMBER that this is for a one week supply only – TLC recommend that you use their products for a full month to gain the most benefit. Although most people lose weight within the first week it may take longer. As with any weight loss or maintenance diet it’s important to make sure to drink lots of water!